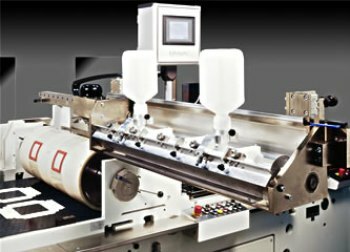 The New Kohmann Simply Pick is able to glue and place precut PVC/PET or any other rigid window material onto carton blanks. Their latest technology enables you to achieve the unparalleled productivity and minimum tolerances. The timed belt feeder can work 1 or 2 -up. The infeed length of the blanks is pre-selected via the input panel. The feeder can be switched on or off separately. The controlling and adjusting of the optional suction air control of the stack lifting system is carried out by means of the SPS control unit of the machine and is programmed via the central input unit. Universal adjustment possibilities offer major flexibility and guarantees high performance at all times. Two transport chains align the blanks coming from the feeder accurately for working in one or dual lane operation. The blanks aligned by the chains are then conveyed from the suction belts to the delivery. The blanks are lying on the suction belts without guide bars only held by a vacuum. Each machine is equipped with 2 suction tables (one table for each lane) each with one transport belt. A single roller upper glue unit with doctor blade ensures an even application of glue on the stereo cylinder. Side scrapers make it possible to top up only the areas where the glue is required. The required amount flows automatically out of glue bottles. 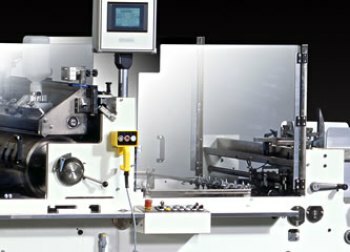 The upper glue unit can be moved sideways out of the machine on easy running guides for cleaning purposes which means substantially reduced set-up times. 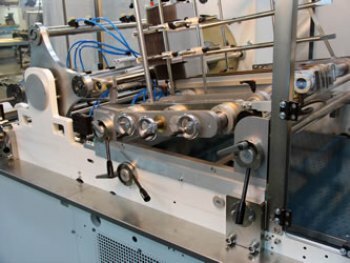 Positioning the upper glue unit above the stereo cylinder in connection with splashguards prevents soiling of the machine or the blanks with glue during production. If one or more blanks are missing on the suction table below the stereo cylinder is lowered automatically, to prevent glue contaminating on the suction belts. The stereo cylinder is divided in the middle for dual lane operation. The glue application stereos can be prepared outside the machine and then clamped to the stereo cylinder. When a job is finished the mounted stereo can be stored for repeat orders. Setting the cycle depending on the carton length is via the input panel of the central input device. The direct drive then alter the speed of the knife cylinder automatically. A wide transport belt infinitively adjustable in height with variable take up rollers makes it possible to deliver even delicate blank shapes trouble free in a shingle arrangement. The gap of the shingle is infinitively variable by potentiometer. The delivery table can be moved away from the machine to facilitate access to the knife station and to ease the film change. This station comprises out of a rotary placer with 4 arms and a positive driven magazine. 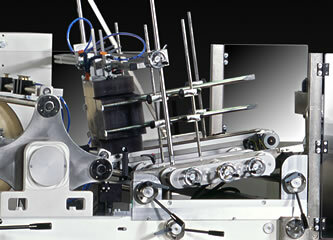 The rotary arms are servo driven for easy and individual setting. The magazine can be set universal depending on the carton style. The motorised movement of the magazine ensures that the window material will be delivered to the pick up position. Part of the delivery will a missing film detector which also operates the compression roller after the window placement. In the input panel you can pre-select and store the following datas: film position to carton and positive movement of magazine. The machine drive, beside the direct driven cylinders, is carried out by a maintenance-free toothed belt drive on the rear side of the machine. Tight tolerances in the positioning of the film are maintainable over a long period of time. The following examples are simple illustrations of typical applications. Please call or e-mail for information pertaining to your specific needs. Fore more information, specifications or o get quote, please fill in this form and we'll get back on you as soon as possible. Thank you.